This book covers parishes from Aghadoe to Ventry and Donquin. The first 209 pages are previewed at Google Books. The entire book can be purchased in eBook version for $11.46 at Lulu.com. Patrick Crowley, creator of the blog West Cork History – History of Durrus Muintervara, has brought out a transcription of burials in the Schull District of County Cork. West Cork is Jim Lannin’s paternal ancestral homeland, with his father’s maternal grandfather, John Skuse, coming from Glengarriff, near Bantry, and his paternal Lannin grandparents, James and Martha, coming from Schull. The burials in these records took place from 1630 through 2014. They include burials of people with the surnames Lannin, Landen, Raycraft, Roycroft, Levis, Johnson, Camier, Skuse, McCarthy, Kingston, Cole, Newman, Shannon, Attridge, Donovan, Hegarty, Jermyn, Barry, Daly, Connell, and O’Driscoll, among others. Digitisation work on the Valuation Office’s Cancelled/Revision Books collection is continuing a-pace. When fully digitised, the collection will be heading online. 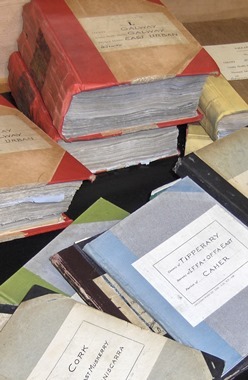 As yet there is no confirmation where that online home will be, but the records will be free to access, that much is certain (which makes the National Archives’s Genealogy website a contender). We’ll see. In the meantime, if you’re visiting the VO and need to handle original books, here’s a reminder: you can scan or photograph the books with your own devices, and there’s no charge. Using the VO’s photocopier does attract a charge, however. Aye, ’tis another beautiful day here in The Villages! The sun is shining, the grass is green, and there might be a rainbow later when the afternoon showers come! My name is Séamus, and I’m one of the little people. ‘Tis I who will be spreading the news about the Irish SIG. We’ll be tellin’ you of the meetin’ days and times, and sharin’ the news about the genealogy of the auld sod. resources of all kinds. I’ll be speakin’ to ye all through this here blog. You all will be able to talk to each other about Erin and Irish genealogy in our new forums. You’ll find it all on VGSIrishSIG ! It’s a great day to be Irish! It seems I’ve finally found me pot of gold, and this website is it!